When it comes to choosing a sushi knife, however, might be a hard job for you to choose the right one because there are many choices out there. Definitely everyone will want to choose the knife that feels good in your hand, and it made of quality materials. In order to do so, first you must determine what type of sushi you will be making because this will determine what types of sushi knife you will buy. Japanese knives are some of the best kitchen knives in the world. The Japanese are well known for their delicate knives work on food, especially when making sushi and sashimi. Different types of sushi utilize different knives. Japanese professional chefs need to purchase all the different types of sushi knives to accomplish their tasks, which include the deba knife, the usaba knife, the yanagiba sashimi knife, and so on. Each knife helps them perform different tasks. But for those cooking at home, or sushi chef starter, only the two types of knives, yanagiba and deba, will be the essential. There are many steps to making a sushi roll: cutting vegetables, cutting fish, and then cutting the roll itself. A sushi knife is sharp, hand-crafted for those specific tasks, and specially designed for delicate cutting, precision slicing and for beautiful and delicious sushi. A sushi knife has slender blade and 1-sided being flat will help it prevents food sticking to the knife, when it particularly comes to cutting sushi roll itself. A sushi knife will bring you a different feeling toward cooking in the kitchen as being said “Fillets Fish Like Nobody’s Business”. What are sushi knives made from? Mainly there are two different types of materials for the Japanese knives. One is high-carbon steel, and the other is stainless steel. Most traditional sushi knives are made of carbon steel. This means that the steel rusts easily, but is capable of attaining a much sharper edge. Stainless knife does not rust and easy to maintain, and its hardness of material prevents the knife from chipping. ​What to notice when it comes to buy a sushi knife? An expensive knife doesn’t mean the best knife. When it comes to find the best knife for yourself, always put your comfortableness on the top of everything. As mentioned above, there are 2 types of materials for making sushi knives, high-carbon steel and stainless steel. If you have to have the sharpest possible knife available, then choose the carbon one because no matter how high quality of the knife is, stainless one can never be better than carbon one, when it comes to the sharpness, and ease of sharpening. However, if you want a low maintenance sushi knife that is not going to rust and you don’t need the sharpest knife, then stainless steel will be the best choice for you. Deba-bocho: A heavy duty clever (meat clever) is good for cutting through bones and cartilage of fish. This sushi knife is not really a required item for a home sushi maker. It is mainly used by professional sushi chefs who spend a part of their long day preparing whole fish for sushi. Yanagiba: the “standard” sashimi knife, used to slice up raw block of fish and fish fillets. 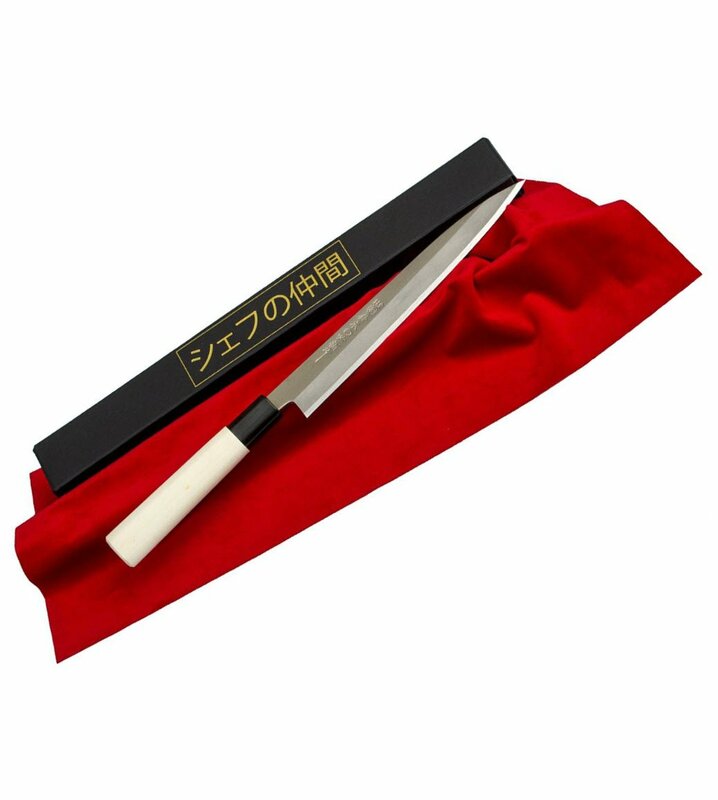 It is the special knife to prepare sushi and sashimi that meets the particular requirements in Japanese sushi cuisine. 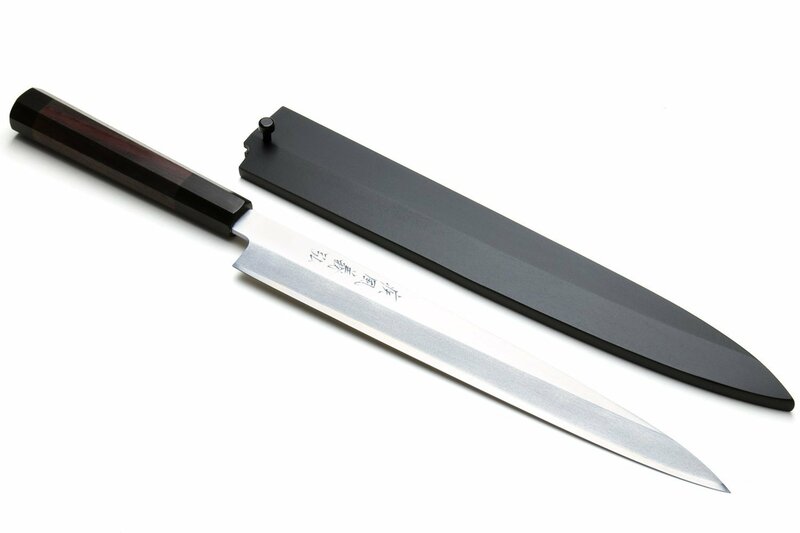 Yanigaba is specially designed for precision slicing of sashimi. From hundred dollars up to thousands of dollars. The SETO cutlery is very sharp and cuts through food very well. The handle is so comfortable and very nice, so it requires less maintenance. 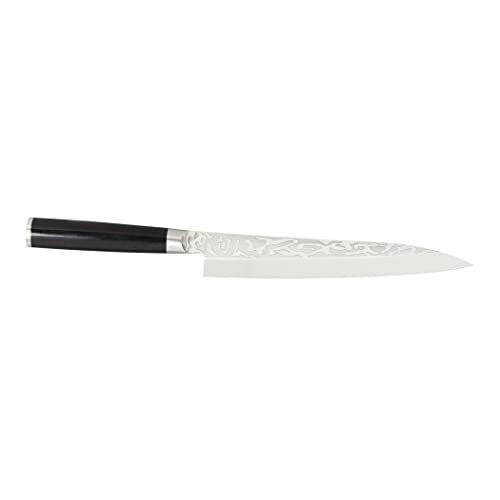 Yoshihiro Chef knife cuts beautifully and cleanly with little effort. The quality and function of the knife can be compared with a knife worth more than $300, or even with a knife up to 1 thousand dollar. 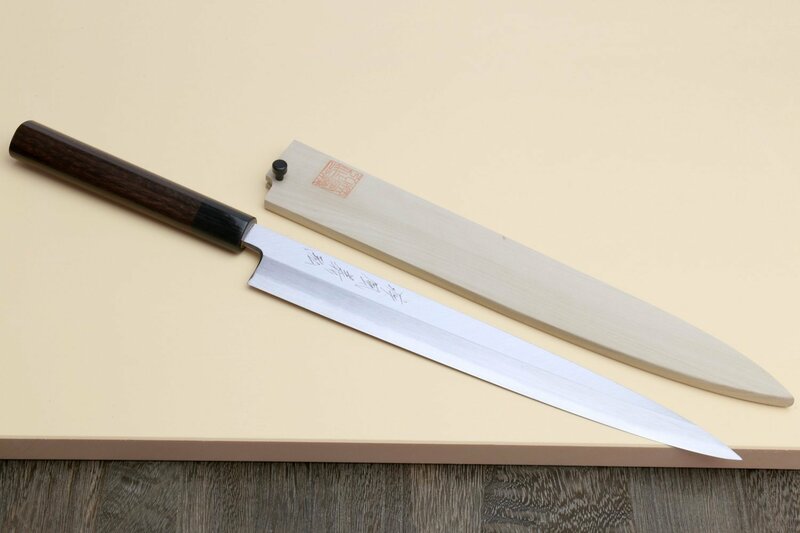 There is no absolutely only one right way to hold a sushi knife; however, a chef starter should follow the “theoretical way” in order to get the best result. When the time leads you to more professional in using knife, you are free to choose the way that makes you comfortable with.